For the past 2 decades, Shloime Dachs has dazzled audiences all over the world with his magical voice & warm personality. In addition to his 5 solo albums, he has sung at hundreds of weddings over the last 20 years. Shloime started his own band several years ago & has become one of the busiest Orchestras in the business. He now returns with an exciting & creative wedding album entitled DANCE All Night! 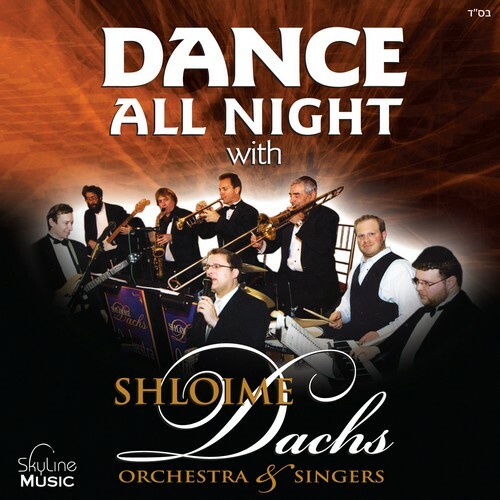 with Shloime Dachs Orchestra & Singers, produced by Shmuly Rosenberg of Skyline Music NYC. It features 80 Minutes of non-stop music with special guest vocalists Yacov Young, Shaully Waldner, Dovid Dachs & Introduces for the very first time Yoni Zigelboum, a new young rising star with boundless energy & a breathtaking voice. There is also a surprise debut appearance of the one & only Nachum Segal & ends with a Bonus Track of Shloime Dachs Orchestra LIVE at a wedding. This is a wedding eXperience second to none! Dist. by Sameach Music.